Danielle Hesson was crowned the 2015 Darke County Jr. Fair Queen. 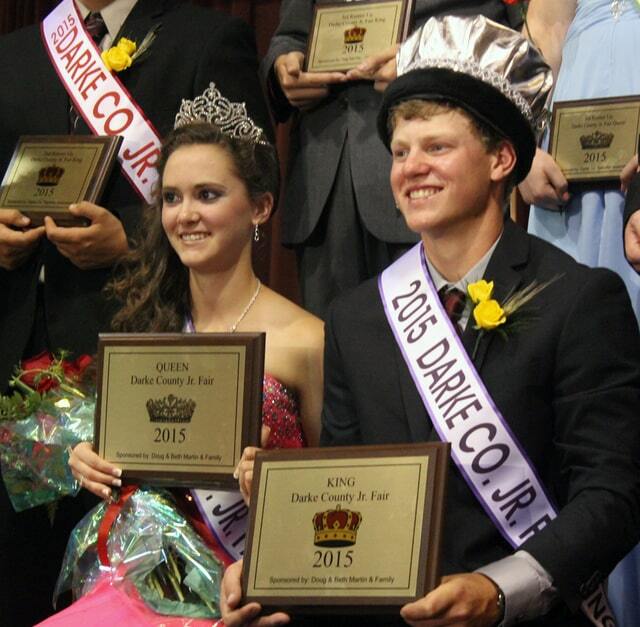 AJ Warner was selected as the 2015 Darke County Jr. Fair King. The 2015 Darke County Jr. Fair King and Queen court are Queen Danielle Hesson, King AJ Warner, runners-up to the fair queen: Rachel Osterloh of Livestock In General 4-H Club, first; MacKenzie Rose Herald Dirmeyer, of Mississinawa Valley/MVCTC FFA, second; and Alyssa Morgan of Versailles FFA chapter, third and runners-up in the king competition were: Bryant Fox of Greenville Rangers 4-H Club, first; Tom Schmitz of the Darke County Junior Fair Board, second; and John Fischer of Ansonia FFA, third. The 2015 Darke County Jr. Fair King AJ Warner and Queen Danielle Hesson were chosen Tuesday night. GREENVILLE – Danielle Hesson and AJ Warner were selected to lead this year’s royal court at the Great Darke County Fair. They were crowned queen and king, respectively, at the pageant Tuesday night at the All Season’s Place at Lighthouse Christian Center. The royal couple each said they were excited about winning. “I am ready to start my year and make sure all junior fair members feel welcomed and show good sportsmanship toward each other,” said Hesson, 16-year-old daughter of Doug and Sherry Hesson and representing Versailles FFA chapter in the competition. “I am looking forward to representing the county and the junior fair,” added Warner, 17, son of Pat and Shelly Warner, Arcanum and representing Top Notch 4-H Club in the pageant. Hesson attends Versailles High School, and Warner Franklin Monroe High School. Runners-up to the fair queen will be Rachel Osterloh of Livestock In General 4-H Club, first; MacKenzie Rose Herald Dirmeyer, of Mississinawa Valley/MVCTC FFA, second; and Alyssa Morgan of Versailles FFA chapter, third. Other queen candidates named in the top eight were Brianna Ashmore, Morgan Taylor McKinney, Kaelyn Marker and Brenna Loxley, while others competing were Megan Bergman, Lily George, Mariana Ramos and Katerri Schmitmeyer. Runners-up in the king competition were: Bryant Fox of Greenville Rangers 4-H Club, first; Tom Schmitz of the Darke County Junior Fair Board, second; and John Fischer of Ansonia FFA, third. Zak Peele was the fifth contestant in the king pageant. Hesson is the current Versailles FFA president and is also a member of Spanish club and Interact club and Future Teachers of America. She is a member of St. Louis Youth Ministry, a Mass server at St. Louis Church and a CYO team member at St. Louis. A member of the Patterson Patchers 4-H Club since 2007, she is a member of the junior fairboard of the goat department, a 4-H camp counselor and a junior fair goat exhibitor. She is hoping that within this next year to decide on which college she wants to attend after graduation, and said she will continue to strive for at least a 3.5 GPA throughout her high school career. As FFA president, she has already started implementing many new activities to help make the chapter the best one possible. Warner, who has 1o years with the junior fair program, is vice president of his 4-H club. In 4-H, he won the John Michael Warner Herdsman Award in 2014; the Age 16 Swine Outstanding Exhibitor in 2014; and the Leadership Medal for “Pulling Strings For John” Campaign in 2012. In FFA, he was student adviser in 2014; recipient of the Star Greenhand Award and FFA Greenhand Degree ( both in 2o03); and the Honor Chapter FFA Degree for Warner Show Pigs in 2011. He attended the State Greenhand Conference in 2012 and the National FFA convention in 2013 and 2014. Warner is also a member of the Pleasant Valley Missionary Church and its Awana Club; participated in the Brethren Disaster Ministries Work Service Project in 2012 and 2013 and the Youth Works Mission Trip in 2011 and 2012. Last year’s royal couple, Thomas Shaw and Jenna Cline, emceed the program. Judges for the evenings were Jackie Seiber of Bradford, Judy Warner of Gettysburg and Sierra Martin of New Madison. Additional highlights of the pageant were the parting words of last year’s king and queen’s court as well as the group’s year-in-review slide show.